Forest engineers, including a Geotechnical Specialist, completed an assessment of the storm-damaged Reds Meadow Road thursday. This road, which accesses prized destinations such as Devils Postpile National Monument, Reds Meadow, and Rainbow Falls Trailhead, has received storm damage after the substantial snowpack from this winter and the subsequent melt-off and flooding. Engineers evaluated a series of longitudinal cracks along the edge of the road and determined that these areas were more stable than anticipated. However, crews have been and will be placing concrete barriers and K Rail along these areas to keep vehicles off these cracks to prevent further degradation. Engineers determined that one area of the road has been structurally compromised and is unsafe for large vehicle traffic such as buses. In this area, a substantial crack was seen near the middle of the road. 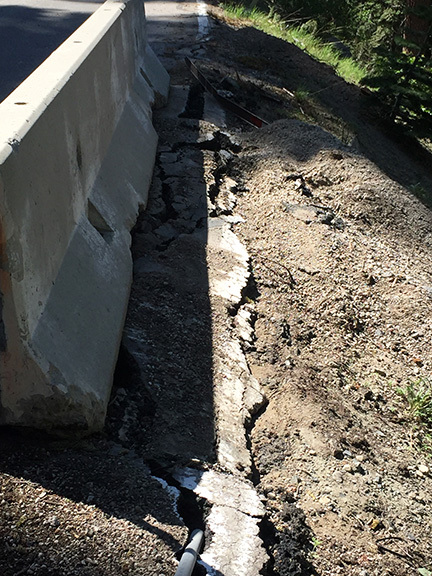 Crews will need to stabilize this segment of the road by placing layers of compacted fill, reconstructing the damaged culvert, and placing concrete curbing to further stabilize the road bed. This work will begin on Monday. The Reds Meadow and Devils Postpile Road remain closed to vehicles. Bicyclists and pedestrians are permitted as long as they avoid areas of construction and wait until they are cleared to travel through construction areas. When repair of the road is underway, pedestrians, bicycles, and essential administrative traffic may be permitted through only during certain time windows so that this work can be completed as quickly as possible. 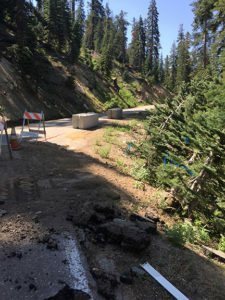 The Inyo National Forest, Devils Postpile National Monument and partners continue to conduct necessary repairs to open roads, which includes brushing, culvert and drainage clearance, repairing potholes, and plowing parking areas, as well as gettingwater and waste water systems operational along the road following a record-breaking year for winter snowpack at 200% of normal. The mission of the U.S. Forest Service, part of the U.S. Department of Agriculture, is to sustain the health, diversity and productivity of the nation’s forests and grasslands to meet the needs of present and future generations. The agency manages 193 million acres of public land, provides assistance to state and private landowners, and maintains the largest forestry research organization in the world. Public lands the Forest Service manages contribute more than $13 billion to the economy each year through visitor spending alone. Those same lands provide 20 percent of the nation’s clean water supply, a value estimated at $7.2 billion per year. The agency has either a direct or indirect role in stewardship of about 80 percent of the 850 million forested acres within the U.S., of which 100 million acres are urban forests where most Americans live. Doesn’t look that bad . Could probably fix it in 2 days with 4 guys and 2 shovels..
Just another reason to shut down public access. Yes, and imagine what could be done with 4 guys and 4 shovels!